Our guide to New York will help you find the best vegetarian restaurants in New York New York. What's trendy in New York this week may well be gone by the time you get here, be it an exhibit, bistro, shop, or celebrity. You'll never see it all -- we won't in a lifetime. But do leave time to enjoy our top attraction: people -- en masse, and of all kinds. Here the tapestry is fully unrolled. The city that never sleeps? Don't worry--you'll rest easy with New York hotel deals near Times Square, Central Park, Broadway, and beyond. Get ready for taxi-cab adventures and soaring skyscrapers, and start spreading the news. There are tons of great vegetarian restaurants in the city of New York, our city guide will help you find the best vegetarian restaurants. You may have a hard time deciding what to do in New York, but we make your decision easy. With enough vegetarian-friendly eateries to last a lifetime, New York City is a vegetarian's dream. There are so many vegetarian and vegan options in New York City that it's just about impossible to pick the best one. New York is home to some of the best organic vegan restaurants in America. 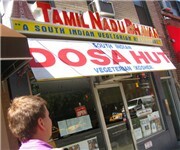 102 Lexington Ave, (212) 679-4497 - Tamilnadu Bhavan is a vegetarian restaurant located in New York NY. 104 Lexington Ave, (212) 684-4010 - Madras Mahal is a vegetarian restaurant located in New York NY. 106 Lexington Ave, (212) 921-7810 - Deepam is a vegetarian restaurant located in New York NY. 11 Bleecker St, (212) 529-5133 - Quartino Bottega Organica is a vegetarian restaurant located in New York NY. 11 W 30th St, (212) 239-0666 - Dimple Indian Vegetarian is a vegetarian restaurant located in New York NY. 110 Lexington Ave, (212) 696-9458 - Pongal is a vegetarian restaurant located in New York NY. 1121 St Nicholas Ave, (212) 927-0908 - Heights Vegetarian is a vegetarian restaurant located in New York NY. 1125 1st Ave, (212) 832-1551 - Merchants NY is a vegetarian restaurant located in New York NY. 119 E 17th St, (212) 674-6677 - Adelina Vegetarian Restaurant is a vegetarian restaurant located in New York NY. 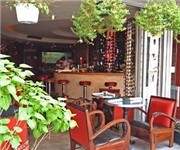 12 Park Ave, (212) 213-1001 - Franchia is a vegetarian restaurant located in New York NY. 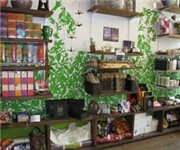 125 E 17th St, (212) 477-7151 - Pure Juice and Takeaway is a vegetarian restaurant located in New York NY. 127 2nd Ave, (212) 505-8065 - B & H Dairy is a vegetarian restaurant located in New York NY. 127 E 28th St, (212) 685-7301 - Tiffin Wallah is a vegetarian restaurant located in New York NY. 129 E 27 St, (212) 689-1999 - Chennai Garden is a vegetarian restaurant located in New York NY. 130 St Marks Pl, (212) 677-7597 - Whole Earth Bakery and Kitchen is a vegetarian restaurant located in New York NY. 132-09 Liberty Ave, (718) 641-8343 - Veggie Castle II is a vegetarian restaurant located in New York NY. 14 W 4th St, (212) 505-8934 - Dojo West Restaurant is a cheap vegetarian joint draws in NYU students. 1413 York Ave, (212) 861-8060 - Green Bean Cafe is a vegetarian restaurant located in New York NY. 1413 York Ave, (212) 861-8060 - Beanocchio's Cafe is a vegetarian restaurant located in New York NY. 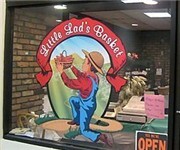 120 Broadway, (212) 227-5744 - Little Lads Bakery is a vegetarian bakery located in New York NY. 171 3rd Ave, (212) 863-9630 - Amai Tea & Bake House is a vegetarian bakery located in New York NY. 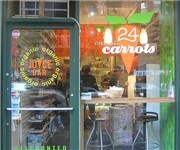 244 W 72 St, (212) 595-2550 - 24 Carrots Organic Juice Bar is a vegetarian juice / smoothy store located in New York NY. 54 W 125 St, (212) 964-4316 - Uptown Juice Bar is a vegetarian juice / smoothy store located in New York NY. 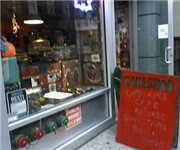 152 Ludlow St, (212) 253-0036 - Cake Shop is a vegetarian coffeeshop / cafe located in New York NY. There are plenty more vegetarian restaurants in New York. See all vegetarian restaurants in New York New York.